Similar to the Drive, Fly, Float tour, this excursion features a thrilling helicopter descent to the canyon floor. This tour allows more time to wander along the bottom of the canyon and take in the views from a unique vantage point. After being picked up at your hotel, you’ll ride through the Mojave Desert in our unique Pink Adventure Tour Trekker vehicle. Enjoy the comfort of your own leather captain’s chair, with plenty of legroom and oversized windows for best views. The Mojave Desert is the only habitat in the world to feature Joshua Trees, so try to spot dense forests of them en route to the Grand Canyon. You’ll also see Lake Mead, a reservoir created by the Hoover Dam. Upon arrival at the West Rim, you’ll climb aboard an ECO Star helicopter for a trip over the edge. Your ride features the latest innovations, like wraparound windows that showcase the canyon from every angle. Theater-style seats and air conditioning maximize comfort, while surround sound headsets and reduced-noise rotors make it easy to hear your personalized tour narration. Your finale comes at a private landing site 300 feet above the river for a rare, up-close look at the area. After your descent, stroll along the rim for photos and learning opportunities. Your local Certified Interpretive Guide has unique insight into the area’s geology, natural landmarks and ecosystems. They will also share information about the native people who call it home. Enjoy a picnic lunch, then see historic dwellings in a Hualapai village. You may even see dances performed in full tribal dress. There's also time to shop for handcrafted gifts, souvenirs, art and sundries. Your next stop is the famous Skywalk—a West Rim must-see. Upgrade your tour for a small $25 fee for unbeatable views from the Skywalk. Not for the faint-of-heart, the Skywalk is a transparent walkway that extends 70 feet past the rock rim and floats 4,000 feet above the canyon floor! You won’t regret stepping onto the glass after you see the vast expanse around you. Don’t miss the chance to have your picture taken by the designated photographer, as cameras and phones aren’t allowed. On the drive back to Las Vegas, your guide will take your picture at the Hoover Dam and regale you with tales of the dam’s construction during the Great Depression. We are proud to provide luxury services on this tour, including a BBQ lunch buffet with vegetarian options, sides and salad, bottled water. We also include all admission fees in your tour. Great way to see the Grand Canyon up close. Comfortable vehicle with a competent guide. Called 48hours ahead of the tour as instructed. They confirmed the date and pick up time of the tour and advised which entrance of our hotel we would be picked up from. We got out a little bit earlier than our pick up time. The jeep was already there waiting, Chris got out to greet us as explain we would just be picking up another couple from another hotel. He then told us that water was available in the cooler box at the back and help ourselves whenever we need it. The jeep was amazing so clean and tidy and so comfortable. We had a great day Chris was great with all history and details of various different things even on the way to the grand canyon. Great lunch, helicopter ride was fantastic. We then headed for the Hoover dam on the way back, Chris said it would take about 1hr 15 so if we were tired a good time to try to have a sleep and told us the seat lean back. Needless to say the tour of us on the jeep decided to take advantage and soon had a great sleep, before reaching the dam.We had various restroom stops on the way there and back and along the way. All in all we had a great day and felt relaxed and able to just enjoy the day as Chris did all the checking us in and did a great job driving us around. 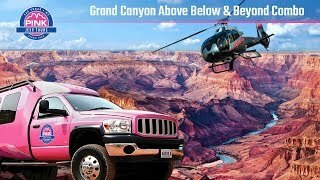 I would definately reccommend pink jeep tours to anyone and would love to one day be back and do another tour with pink jeep tours again. Great service and transport. It was great! It was very informative, close-up and personable. John Holmes was incredible. He was personable himself. He knew a lot and was very detailed. It was wonderful. We were just three on the tour and Don was really helpful in his explanations as my husband doesn’t speak much english. He was also very helpful with my son ho tried to speak with him He knows a lot of information about all the places in the tour and he explained everything in a very easy and interesting way. Jesse was personable, patient, accommodating, entertaining, and went above and beyond. He engaged my love of romcom movies, while talking to my husband about the Hoover Dam and it's history. Jesse got us everywhere we needed to go-quick, helping us avoid the crowds. Great tour, made better by his company.